As I’ve learned by working on our Bat Mitzvah Comes of Age exhibition, presented with Moving Traditions and on view now at The Laurie M. Tisch Gallery at The JCC in Manhattan, the history of bat mitzvah in America is best told through the personal stories of the young women and their families who championed this coming-of-age celebration in their communities. At Judith Paull’s West Hartford, Connecticut synagogue—where Morris Silverman was the rabbi and Althea O. Silverman the rebbetizin—the young women of the 1946 bat mitzvah club studied Althea’s seminal publication, The Jewish Home Beautiful, as they prepared to mark their coming-of-age. For her club project Judith created a Passover haggadah which features a re-written Four Questions among other thoughtful revisions to traditional texts read during the Passover seder. 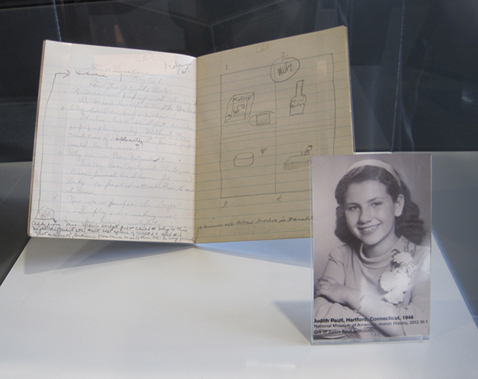 Judith recently donated her haggadah to the Museum’s collection through our current initiative to collect and preserve bat mitzvah artifacts in recognition of the 90th anniversary of bat mitzvah in America—that of another Judith, Judith Kaplan. We’ve installed the haggadah in our first floor highlight case near the lobby entrance just in time to mark this special anniversary, and conveniently, right before Passover, too. To learn more about Bat Mitzvah Comes of Age see this article from The Jewish Ledger that links the exhibition with Judith’s personal bat mitzvah story.